In this groundbreaking walk through Scripture, Dr. Sleeth convincingly makes the case why trees are essential to every Christian’s understanding of God. There’s a tree on the first page of Genesis and the last page of Revelation. The Bible refers to itself as a Tree of Life (Proverbs 3:18). Every major Biblical character has a tree associated with them. This is no accident. When we lose track of the trees in Scripture, we miss essential lessons of faith necessary for our growth. 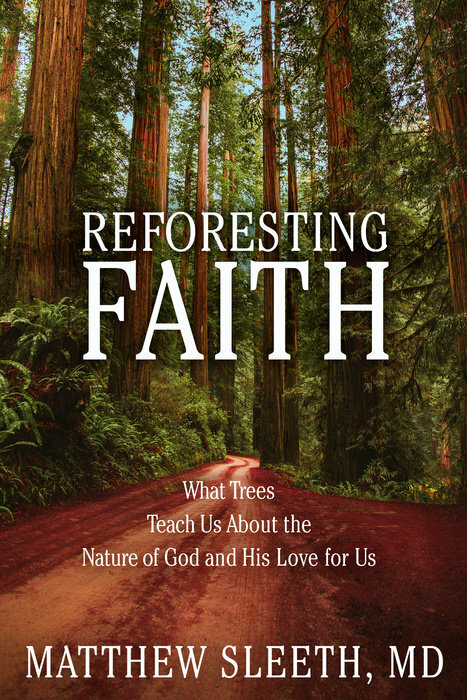 Reforesting Faith is the rare book that connects those who love the Creator with creation, and those who love creation with the Creator. Join Dr. Matthew Sleeth as he explores the Bible’s trail of trees and reveals the wonders of the nature of God and his love for us. You’ll be amazed at how science is just beginning to catch up to the truths described in Scripture thousands of years ago. Once you discover the hidden language of trees, your walk through the woods—and through Scripture— will never be the same.